In a statement posted to Facebook, Brenda Thompson, CEO of Whispering Hearts Horse Rescue Centre, said the OSPCA has "failed miserably" to protect the horses and it's time for a new animal protection system in the province. The head of a horse rescue centre is calling on the province to halt funding to the Ontario SPCA, saying the condition of three horses near Waterford, Ont. show the organization is no longer making protecting animals a priority. In a statement posted to Facebook, Brenda Thompson, CEO of Whispering Hearts Horse Rescue Centre said she believes the events in Waterford show it's time for a new animal protection system in the province. "The OSPCA had the legislated authority to protect these horses in Waterford but they have failed miserably," she wrote. Protesters have gathered outside a hobby farm near Cockshutt Road and Thompson Road East for several days after photos showing the horses looking thin and frail were posted to Facebook. One of the horses was euthanized Saturday. The other two are still on the property. The demonstrators say the OSPCA failed to take action to protect the horses and allowed their condition to deteriorate. But the animal welfare agency argues the pictures don't tell the whole story. It says the horses are simply sick and have been receiving veterinary care. The protests have pitted animal advocates against the OSPCA and are adding fuel to an ongoing debate about whether or not the agency is capable of protecting livestock and other large animals by properly investigating complaints. A recent report by the Canadian Press stated the OSPCA wants to pull back from investigating cruelty cases involving livestock and horses because of a lack of funding. Thompson also stated she believes the situation surrounding the three horses shows the society has not complied with the terms of its almost $6 million funding agreement with the Ministry of Community Safety and Correctional Services, so funding should stop until a forensic audit of the organization can be completed. "It is outrageous that an organization that has become so ineffective and unaccountable continues to receive public money and donor dollars while failing to do the important job they were created to do." 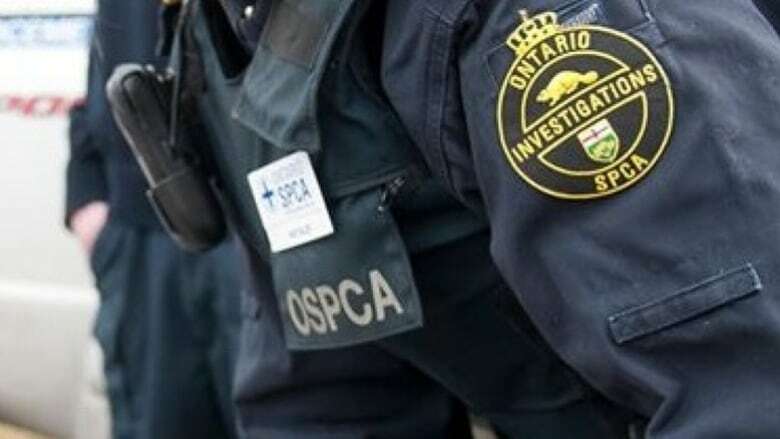 In response to questions about Thompson's statement and petition, OSPCA spokesperson Melissa Kosowan said there have been "numerous misconceptions and inaccuracies" circulating on social media in recent days that show a "general lack of understanding" about Ontario's animal welfare laws. Kosowan added the agency has been working on restructuring their service to fit within available funding and aims to be "right-sized" by 2019 or sooner. In the meantime, "the Ontario SPCA continues to enforce provincial animal welfare legislation for horses and livestock," she wrote. "We have always taken an active role in researching how we can better serve animal welfare in Ontario." As for the two surviving horses, Kosowan said neither the OSPCA nor the OPP have the authority to remove them. "We will continue to monitor the condition of the animals, working with the owners and their veterinarian to ensure their health and well-being." A spokesperson for the ministry said the government is aware of the situation near Waterford and is "concerned about the horses' wellbeing." Richard Clark said the ministry "takes animal welfare issues very seriously," but did not directly respond to questions from CBC News about Thomspon's calls for funding to stop and a forensic audit to be completed. Thompson isn't the only one questioning why the OSPCA is responsible for enforcing animal welfare laws in Ontario. Animal rights lawyer and executive director of Animal Justice, Camille Labchuk, pointed out there's no other area of law where the province relies on a charity for enforcement. "In our view animal welfare should be a public responsibility. It should be taken on by the government and it shouldn't be something we shove off to a private charity," she explained. Labchuk said both animal advocates and those accused of crimes by the OSPCA have raised concerns about a lack of transparency and accountability with the organization. Questions have also been asked about whether asking for donations from the very people it's supposed to be policing could be considered a conflict of interest. The lawyer said another major issue is the "pittance" of funding the society is given considering the size of their task. "There are tens, likely hundreds of millions of animals in Ontario right now and the OSPCA simply can't effectively oversee their wellbeing with that minor amount of funding."